The surprising discovery of four frog fossils, which were trapped in amber about 100 million years ago, is the earliest direct proof of the existence of frogs in a prehistoric tropical climate. The study was published on 14th June in Scientific Reports. We learn that the discovered fossils are not complete, which makes it very difficult to place frogs in a proper place in their family tree. One of them preserved only a part of the skull and the other outline of the skeleton, although initial research using computed tomography did not reveal the presence of the skeletal material. All the fossils were called Electrorana limoae by scientists. Further research has shown that amphibians are the most similar to the modern frog group, which includes toads. David Blackburn, biologist at the Florida Natural History Museum in Gainesville, says that despite the history of amphibians spanning more than 200 million years, the fossils discovered so far contain relatively few frogs. Discoveries such as these are undoubtedly a significant event in the world of biology. The scientist also adds that the current state of knowledge allows us to suggest that frogs have been doing well on Earth for hundreds of millions of years. The discovery of frog fossils in amber is much more exciting than the study of the "traditional" fossil record because it allows scientists to learn a little more about the environment in which they have lived. Apart from these frogs, inside of the amber were discovered spiders, velvet worms, and pieces of bamboo. This is a fairly clear indication of the tropical environment. Thanks to this, scientists have the opportunity to learn more about the history of amphibians that accompany us from the very beginning of our civilization. 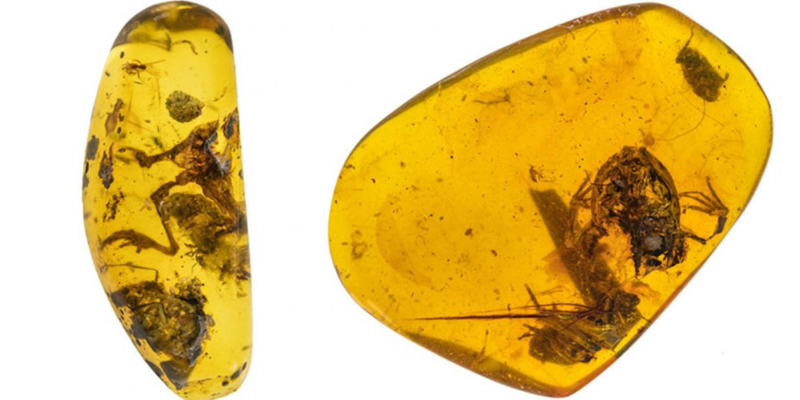 Amber itself is a great source of discoveries of various animals and plants, which unfortunately ended their lives accidentally falling into sticky smear or in another way entered its interior. For example, some time ago in a mine in Burma there was discovered amber with a submerged dinosaur tail inside, and in another case a chick from 100 millions years ago.